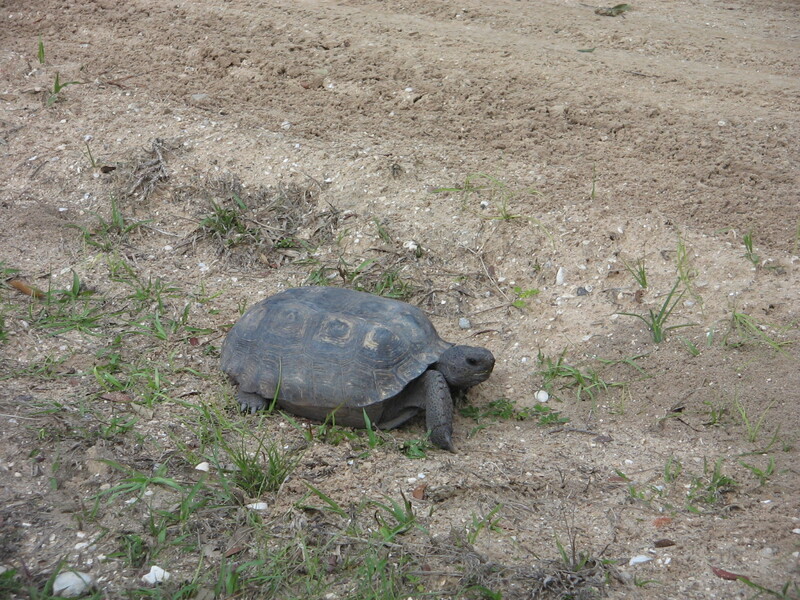 If the Everglades Parkway (I-75) that cuts across the bottom of Florida can be called “Alligator Alley”, we decided that the Van Fleet Trail that we rode our bikes on this week should be called “Gopher Tortoise Alley.” We lost count of how many gopher tortoises we spotted the first day on the trail. At first it seemed important to get a good picture of one of the critters. They live in holes dug into the sandy banks along the trail and you usually don’t see them until you are right next to them. 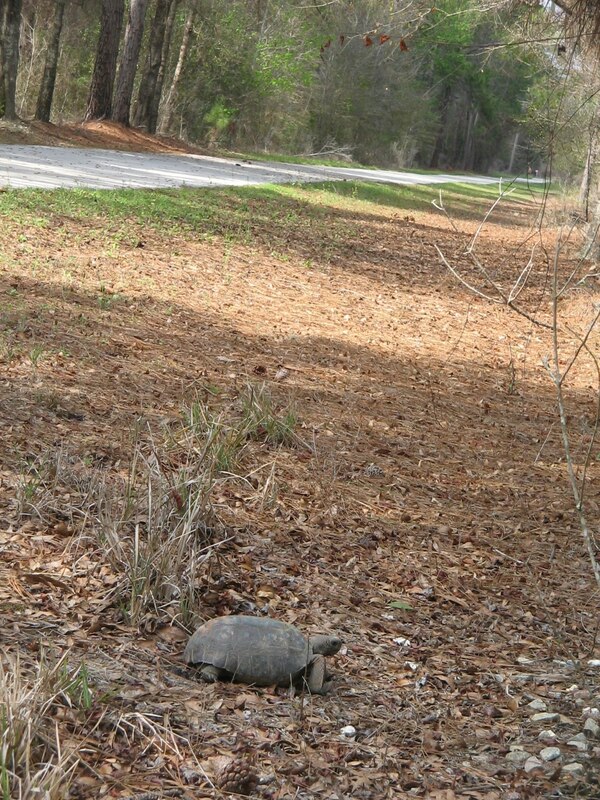 Tortoises, being like turtles, are something that you think of as slow moving so we were sure we could stop our bikes, back up and snap a photo. Before long, though, we felt that we were playing a silly hide and seek game. Tortoises are much smarter and faster than they look. We would be as quiet and sneaky as we could but just as soon as we had our cameras pointed at one it would vanish in a flash back into its hole. 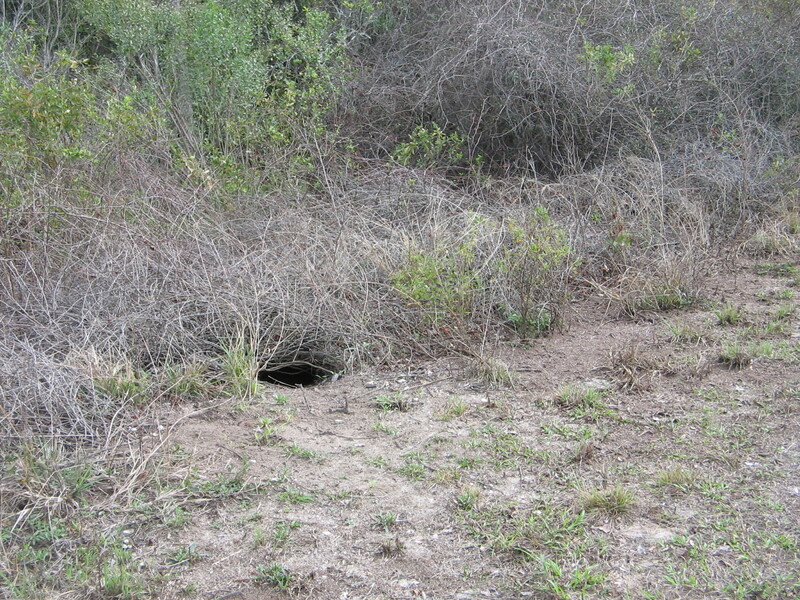 One of the gopher tortoise holes. Lee trying to sneak up on a tortoise. Finally, when we decided it was time to quit stopping every time we saw a tortoise, we began to see one or two that had ventured a bit further away from its hole. That allowed us to catch a photo before they disappeared. And then we came upon a situation where we really got up close and personal. Here was a poor tortoise that had somehow ended up stranded on its back. A second tortoise stood next to it looking sympathetic and just as helpless. Lee played good samaritan, got a stick and pushed the stranded tortoise back over on its feet. The other tortoise quickly scampered off, while the rescued one seemed to pause a minute to get its bearings before it, too, quickly disappeared. Makes you wonder how they get stranded on their backs and if there isn’t a human around to rescue them how do they get out of their predicament? Speaking of predicaments, the first hour of this planned trip on the Van Fleet Trail found us in a predicament. 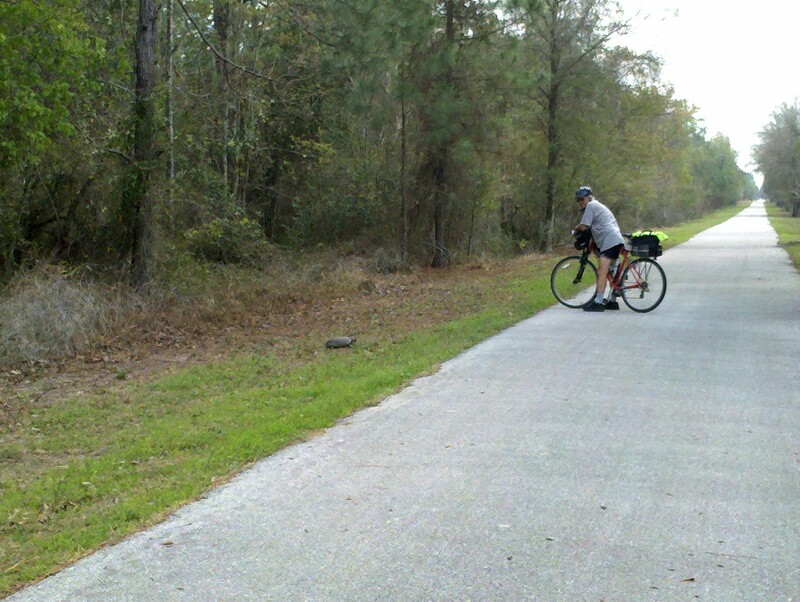 The trail is 29 miles long, starting at the Mabel Trailhead near Claremont and ending at the Polk City Trailhead. Our friends, the Clendenin’s, who spend the winter in their RV at a park in Polk City, had kindly offered us overnight accommodations in an outside apartment on their lot. Our plan was to bike the 29 miles from the Mabel Trailhead to Polk City, spend the night, and then bike back the next day. It took some additional planning and packing because of the threatened rain and the fact that this was an overnighter where we had to think of things we usually don’t need to carry on our bikes. We ignored the dark clouds and few sprinkles of rain and crossed our fingers that we had all we needed as we set off down the trail. But what is this sign here as we left the parking area and crossed the boundary that begins the official trail? Is this really an official sign? 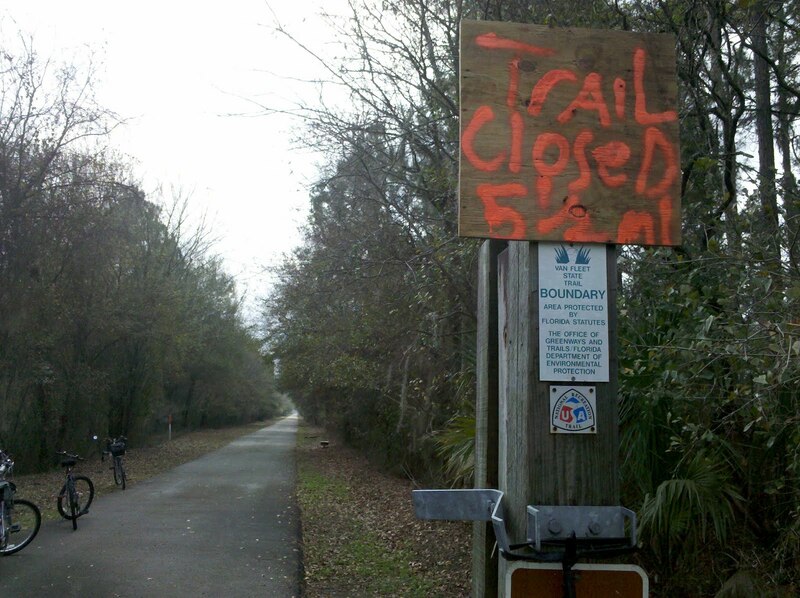 Is the trail really closed? We decided to ignore the sign and see for ourselves what was up ahead, since no one else was around that we could ask. 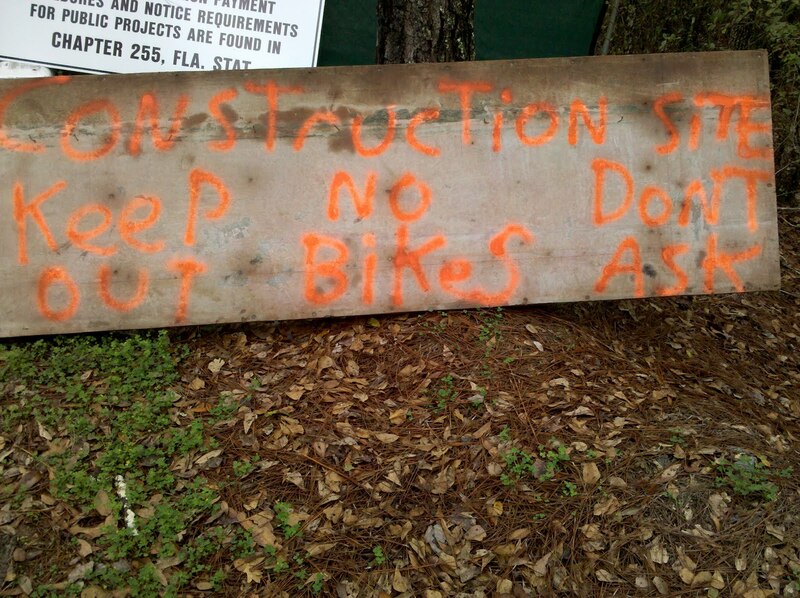 After pedaling 5-1/2 miles we saw that the trail ahead was fenced off, there was no one around, and here was another hand painted sign. We could peer around the fence and see up the trail to where there was a second fence but there was nothing that we could see that looked like construction on the trail. There was a footpath around the edge of the fence and since I couldn’t stand the thought of having to turn around not knowing if there really was no way around this thing, I pushed my bike around the fence and pedaled up to the next fence. Oops, I guess the signs were right. We weren’t going to be getting through this swamp. 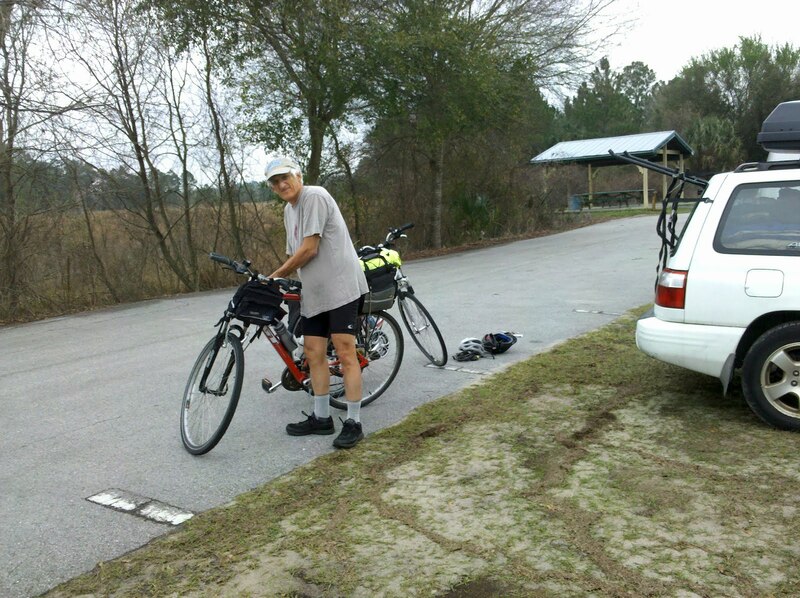 We had to pedal back to the car, load up the bikes again, and drive down to the next trailhead. So much for all our planning. Lesson learned is to always check a website for trail conditions before setting off on a trip. 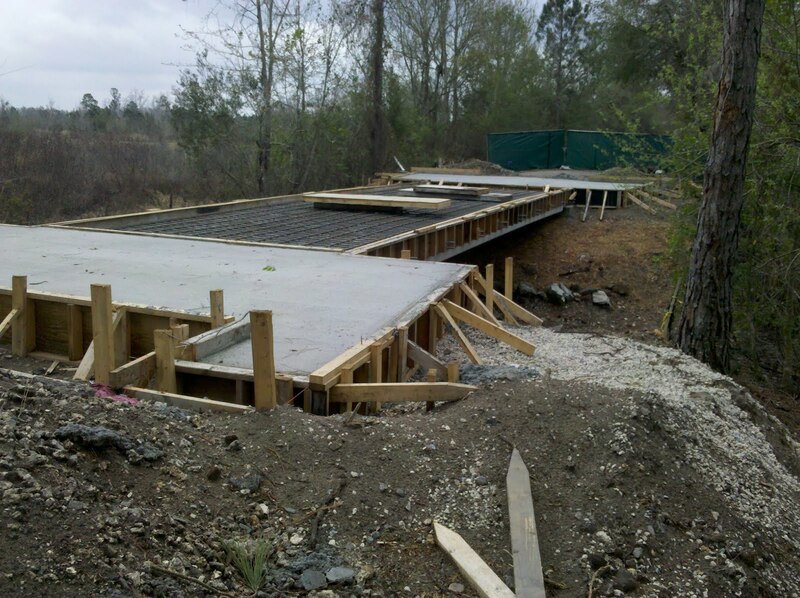 Later that day we did see some official signs about the construction project, but had failed to see the one inside the kiosk before we started our trip at the Mabel Trailhead. After the initial frustration the rest of the trip was quite enjoyable. We especially appreciated the hospitality of the Clendenin’s that enabled us to enjoy a relaxing evening in Polk City and a good rest before pedaling back the next day. 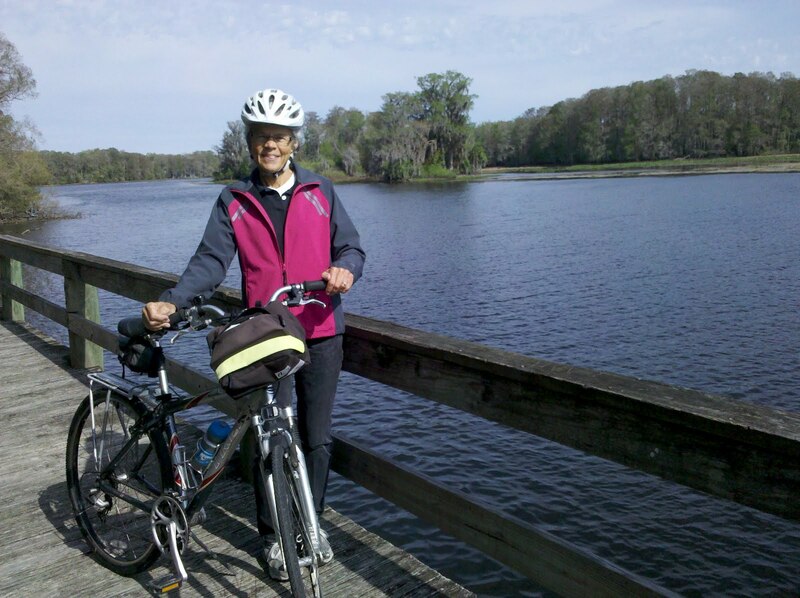 One more bike trip that we had on our bucket list before leaving this area was to pedal more of the Withlacoochee State Trail. 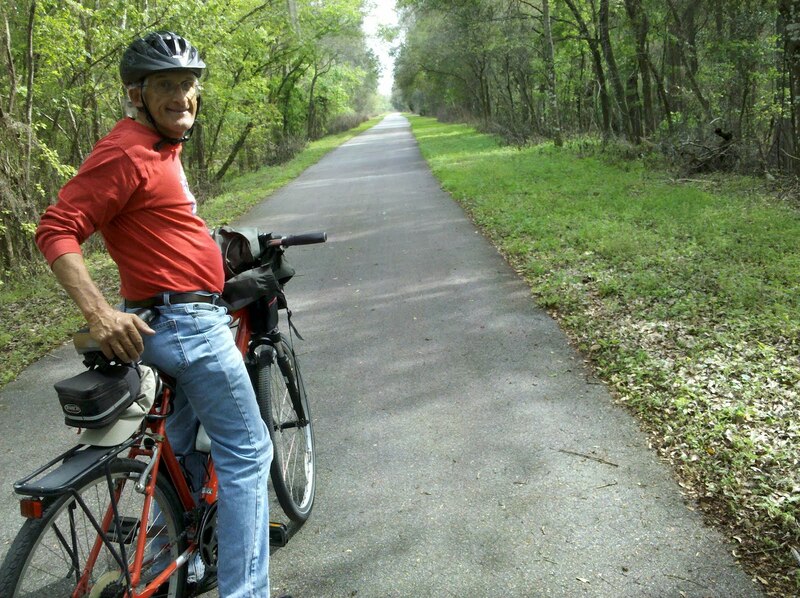 A couple of weeks ago we had ridden with our friend, Jerry, on a 32-mile ride that was out-and-back from the Gulf Junction (northernmost) Trailhead, down to Inverness. That left 30 miles of trail from Inverness down to the southernmost trailhead at Trilby that we hadn’t yet seen. Unlike our two days on the Van Fleet Trail with temperatures in the 80’s and wind from the south, today brought in a cold front with temperatures in the low 60’s and winds from the north. 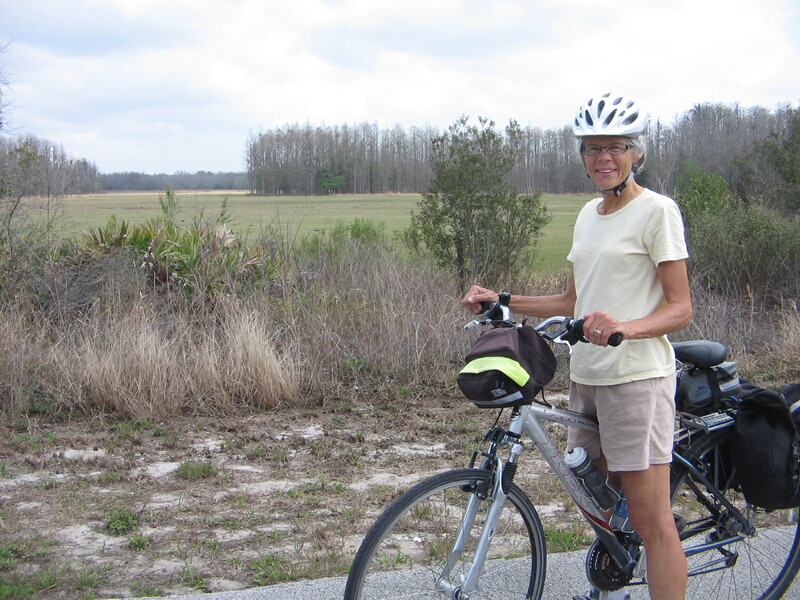 Our hope was to have headwinds in the morning and tailwinds in the afternoon so we started at the Ridge Manor trailhead and pedaled north for 17 miles to Floral City. Wearing long sleeves and pants today, instead of shorts and T-shirts as we did the previous two days, but the winds weren’t too bad and the day was enjoyable. A stop at Lake Townsen, near Nobleton. That’s been quite a bit of pedaling the last 3 days and we will probably take a break tomorrow from bike riding. But no breaks from adventures because now its time to move on and who knows where we will be next and what fun awaits? 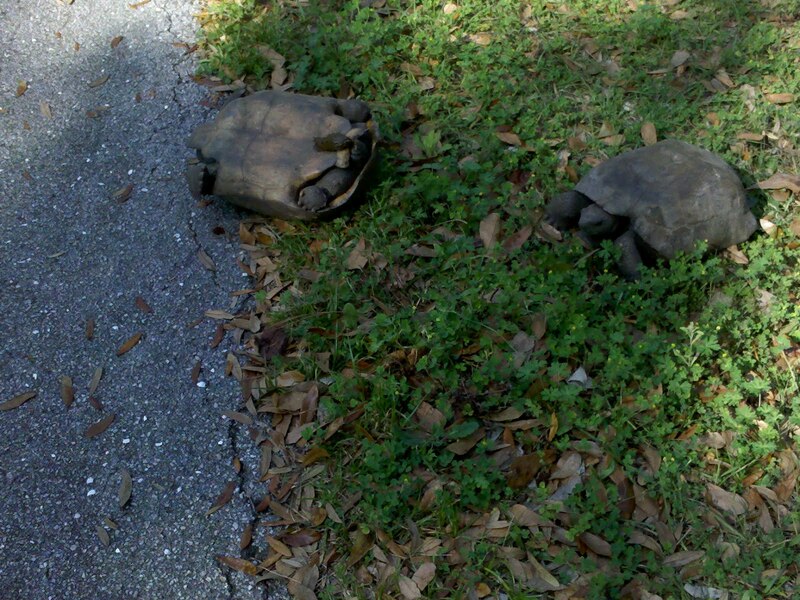 I may be making this up, but I think male tortoises battle with rivals over potential mates (is it mating season?). One strategy is to flip an opponent over on its back and declare victory. Sound plausible? Great comment. We had wondered if maybe it was something like that. 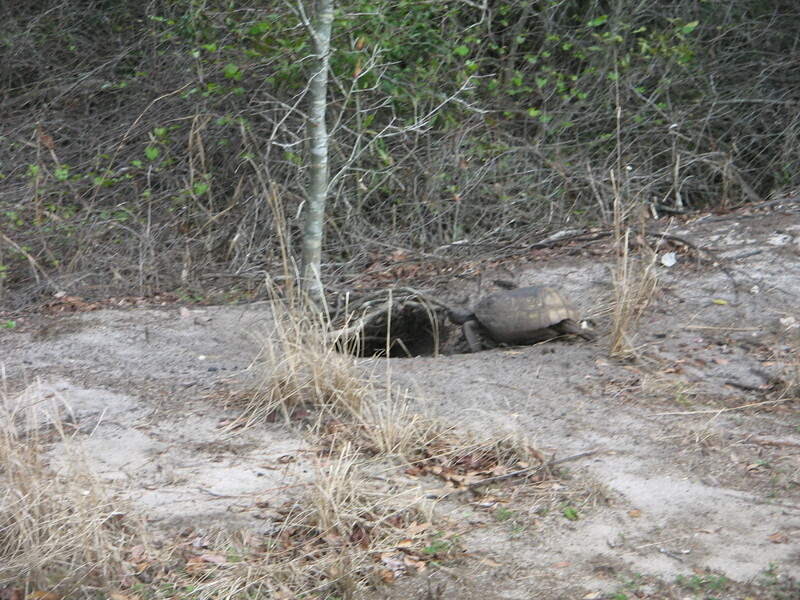 Did a bit more research on the gopher tortoise and found that the mating season is generally April to November, but these could have been exhibiting the behavior earlier in the season. Found some interesting photos that were of battling desert tortoises, which seem to be a species very similar to those here in Florida.